After Jesus arrived on Earth at His 2nd Coming and the Rapture has taken place, what will happen on Earth? 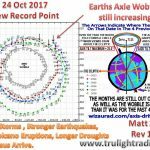 This is a follow up article on my Previous Article – Earthquakes, Volcanoes and Wobble of Earths Axle – Signs of the Times. During the 2nd Coming of Jesus Christ the Earth will Fall over and the Plates that divide the earth into Continents will slide over each other to try in balancing the Earth. Smaller under water plates will move under larger plates. This will cause an earth moving effect. One Plate will glide over the other and wipe all buildings and more from the Top surface. Meaning all valleys will be leveled with all mountains and any top soil, Humans, Buildings, Roads and more will be rolled up like a carpet or pieces of Instant Lawn. This movement of the Plates will cause Great Earthquakes and Islands and Mountains to wipe of the face of the Earth and all Volcanoes will erupt. For example the American Plate will slide over the Australian Plate and both Australia and New Zealand will sink under the sea. Then the African Plate will collide with the American Plate and one of these plates will move over the other one. This reality Jesus showed John in the Book Revelations in the Bible. The Minutes after the Rapture and during the Battle of Armageddon. Plate tectonics is the theory that Earth’s outer shell is divided into several plates that glide over the mantle, the rocky inner layer above the core of lava. The plates act like a hard and rigid shell compared to Earth’s mantle. This strong outer layer is called the lithosphere. The Joints of these Plates are openings were Lava leaks through, that forms Volcanoes on land and sea. Geologists generally agree that the following tectonic plates currently exist on the Earth’s surface with roughly definable boundaries. Tectonic plates are sometimes subdivided into three fairly arbitrary categories: major (or primary) plates, minor (or secondary) plates, and micro-plates (or tertiary plates). Jesus showed John! The great city was divided into three parts. Rev 16 v 20 , Saying Jerusalem will break into 3 Parts. What we discovered so Far. Israel and Jerusalem is on the Arabian Plate. Arabian Plate is a minor tectonic plate in the northern and eastern hemispheres. It is one of three continental plates (the African, Arabian, and Indian Plates) that have been moving northward in recent geological history and colliding with the Eurasian Plate. This is resulting in a mingling of plate pieces and mountain ranges extending in the west from the Pyrenees, crossing Southern Europe to Iran, forming the Alborz and Zagros Mountains, to the Himalayas and ranges of southeast Asia. The Arabian Plate consists mostly of the Arabian peninsula; it extends eastward at the Sinai and the Red Sea and northward to the Levant. The plate borders are: East, with the Indian Plate, at the Owen Fracture Zone, South, with the African Plate to the west and the Somali Plate and the Indian Plate to the east, West, a left lateral fault boundary with the African Plate called the Dead Sea Transform (DST), and a divergent boundary with the African Plate called the Red Sea Rift which runs the length of the Red Sea; and North, complex convergent boundary with the Anatolian Plate and Eurasian Plate. The collision between the Arabian Plate and Eurasia is pushing up the Zagros Mountains of Iran. Because the Arabian Plate and Eurasia Plate collide, many cities are in danger such as those in southeastern Turkey (which is on the Arabian Plate). These dangers include earthquakes, tsunamis, and volcanoes. My summary on the effects and how the City of Jerusalem will break into 3 Parts is this? The Arabian Plate broken away from 3 Major Plates at The creation of the Earth as per the Book of Genesis. The Arabian plate broke away from the African, Indian and Eurasian Plates. And when the Earth falls over , these 3 Plates will then bump back into the Arabian plate and crack the Arabian Plate into 3 Parts and the center Point of breakup , Mount Moriah also known as Temple Mount , were the previous 2 Jewish Temples was Build and the new 3rd Jewish Temple of Jerusalem will be build. I requested more info from a Professor Zohar Gvirtzman from the University of Israel in the department of Geological Survey of Israel, to send me more info on the Chronostratigraphic table and subsidence curves of Israel. When the Earth falls over, the North Pole will Move to Mount Moriah, Jerusalem and Stop on the Hill of Golgotha, at the Point where the Gross of Jesus stood. The Position of the Cross will become the End Time North. The North Pole Position has already moved 7 Meters in that direction of Golgotha in the past 3 Years.